Competition from other companies always pressed Gibson into coming up with some of its most innovative designs. The rivalry with Epiphone in the twenties and thirties spurred both companies to produce the finest acoustic archtop guitars of all time. By the 1950s, amplified guitars had gained prominence, and a new company had entered the fray – Fender. Its founder, Leo Fender, had developed the first mass-produced solidbody electric guitar. Gibson president Ted McCarty took notice when Fender’s Telecaster sales became significant and developed a fancier solidbody for Gibson with the help of guitar wizard Les Paul. The classy looking Les Paul Model in turn inspired Leo to come up with his futuristic masterpiece, the Stratocaster. When Ted McCarty saw how well the Fender Stratocaster was selling, he decided that Gibson needed to come up some wild, exciting designs of its own to shake the company’s conservative, old-fashioned image. After examining the designs of several artists, McCarty choose three designs to submit to the patent office in June of 1957. These were the Explorer, the Moderne and the Flying V. The patents were granted in January of 1958. 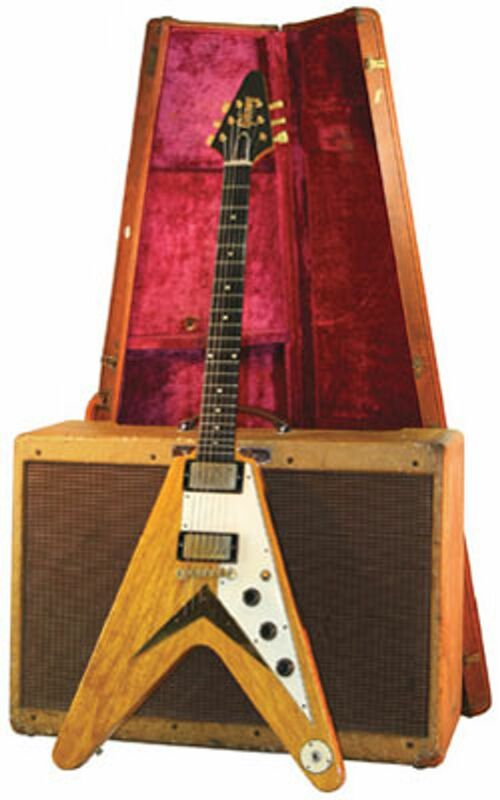 While prototypes of each were made, only the Explorer and the Flying V made it into production. The Flying Vs and Explorers of the late fifties were made of a light colored African mahogany called Korina. McCarty chose this wood due to the popularity of blonde hued furniture at the time, and because no additional bleaching or tinting was required. These “modernistic” guitars initially created the excitement that McCarty intended, but ultimately didn’t catch on with the guitar buying public until years after the small initial run had been discontinued. 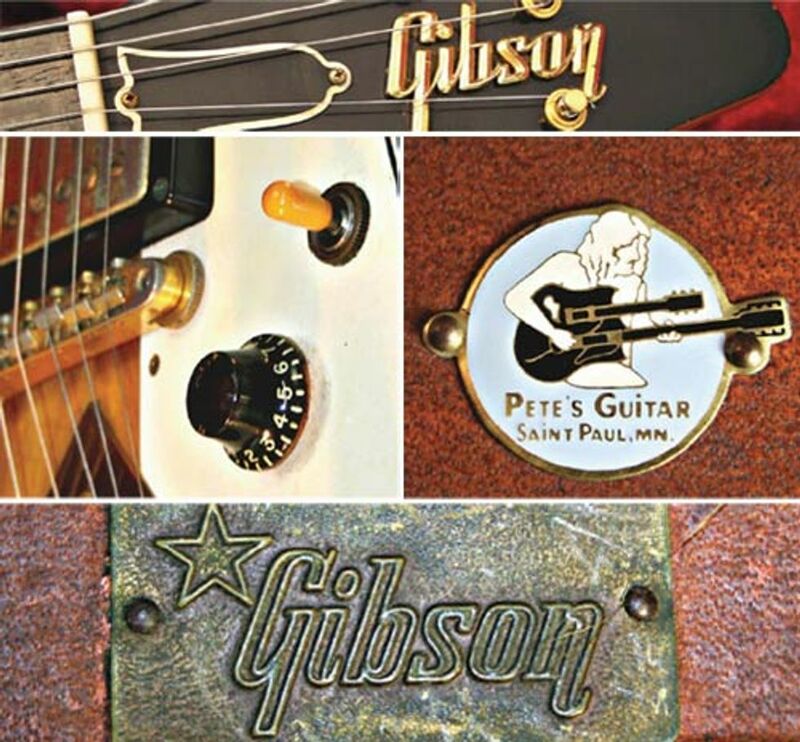 More information on these guitars can be found in Gibson Electrics - The Classic Years by A.R. Duchossoir, Flying V: The Illustrated History of this Modernistic Guitar by Larry Meiners, and Gibson Guitars: Ted McCarty’s Golden Era: 1948-1966 by Gil Hembree. Dave’s notes: I purchased this guitar from the late Pete Alenov (Pete’s Guitars) and as I recall, this one had been previously owned by Michael Schenker of the Scorpions. Pete was a good friend and mentor, and taught me much about the business. He also introduced me to many touring acts and opened quite a few doors for our business. I have fond memories of the man and I think of him every time I see this guitar.